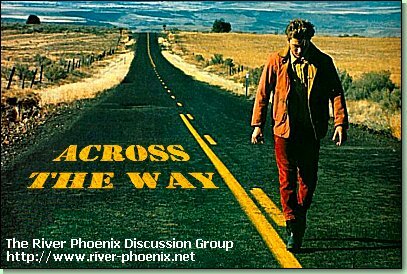 You have just found "Across The Way" - the River Phoenix discussion group. Since 1996, this group has been the focal point for a community of friends who respect and miss the late River Phoenix. 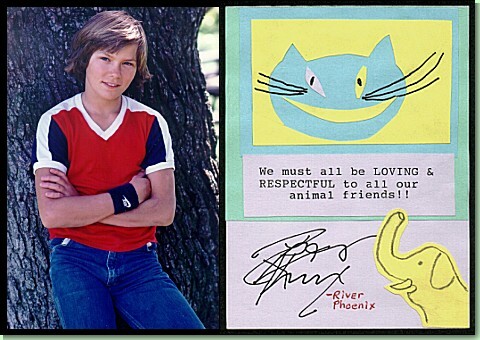 River was a remarkably talented and successful young actor who, unusual for the industry in which he worked, radiated a particularly strong sense of compassion not only for all his fellow human-beings, but also the environment in which we live and the animals we share it with. In addition to his work in the film industry, River was also an accomplished musician who wrote several songs including "Across The Way" after which this group is named. A particularly safe haven on the Net, spam-free, and suitable for people of all ages, we welcome new and old members alike into a world-wide society of River Friends. Browse our long and rich history of messages, post a brand new topic for discussion in one of our forums using your browser or regular email client, visit our gallery, or join us in the chat-room to meet other members in real-time. Discussions currently taking place around the Campfire - our main River Phoenix discussion forum. We operate a second forum for all other discussion topics. This is what we're talking about in the Treehouse right now. This third forum is a great place for learning about and getting to know your new River Friends. This is where users post their daily web-log journals. Thread "Re: [acrosstheway] Re: RIVER EN ESPANOL" has now been viewed 1100 times. Thread "The Celluloid Closet, This Road will never End" has now been viewed 4800 times. Thread "Favourite pic of Riv" has now been viewed 4800 times. Thread "Please read." has now been viewed 1200 times. Thread "Remaking DarkBlood!!!!!!!!" has now been viewed 3400 times. Thread "New file uploaded to acrosstheway" has now been viewed 1000 times. Thread "A friend of River shares precious memories..." has now been viewed 4000 times. Thread "Re: [acrosstheway] How I met One of River's Friend's" has now been viewed 1300 times. Thread "Anything special planned for 10th anniversary?" has now been viewed 1100 times. Thread "Lost" has now been viewed 2800 times. Thread "Re: [acrosstheway] Re: dreams" has now been viewed 1200 times. Thread "Re: [acrosstheway] Re: My Own Private Idaho -2" has now been viewed 1100 times. Thread "Haiku" has now been viewed 2500 times. Thread "I have a question for all Riverfriends" has now been viewed 2000 times. Thread "Dont know" has now been viewed 2000 times. Thread "Re: [acrosstheway] Heavy-Hearted" has now been viewed 1100 times. Thread "River's Vedic Stars Article" has now been viewed 3500 times. Thread "What Song is This?" has now been viewed 1900 times. Thread "Project We R. Phoenix, Do Something Good." has now been viewed 1800 times. Thread "Re: [acrosstheway] songs that remind you of River" has now been viewed 1100 times. Use this option to quickly search through either Across The Way - The River Phoenix Discussion Group, or Rio's Attic - The River Phoenix Encyclopedia.